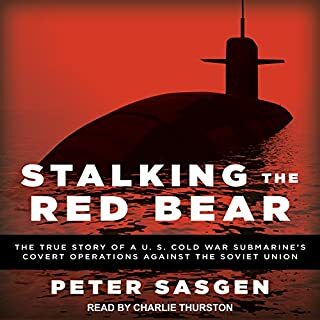 Stalking the Red Bear, for the first time ever, describes the action principally from the perspective of a commanding officer of a nuclear submarine during the Cold War - the one man aboard a sub who makes the critical decisions - taking us closer to the Soviet target than any work on submarine espionage has ever done before. 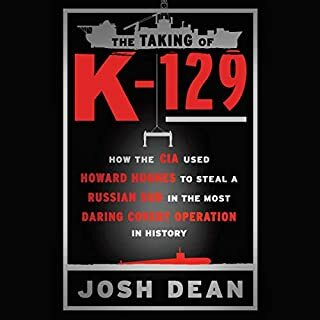 This is the untold story of a covert submarine espionage operation against the Soviet Union during the Cold War as experienced by the commanding officer of an active submarine. One Navy admiral called it "one of the greatest unsolved sea mysteries of our era". To this day, the U.S. Navy officially describes it an inexplicable accident. For decades, the real story of the disaster has eluded journalists, historians, and the family members of the lost crew. 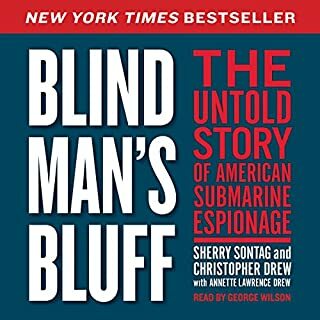 But a small handful of Navy and government officials knew the truth from the very beginning: the sinking of the nuclear submarine U.S.S. Scorpion and its crew of 99 men, on May 22, 1968, was an act of war. Forty years ago, in May 1968, the submarine USS Scorpion sank in mysterious circumstances with a loss of 99 lives. The tragedy occurred during the height of the Cold War between the United States and the Soviet Union. Winning the Cold War is in the balance. A super-secret, off-the-books spy organization; a security-clearance starting at top secret and going up from there; an attack by giant squid during a 1,000-foot dive while breathing an exotic gas; a cat's whisker escape from death during a three-day decompression - and that's just the first two chapters of Operation Ivy Bells before the action really gets underway. Blending personal experience and real-world events in a fictional wrapping, Operation Ivy Bells offers a never-before-seen glimpse of these heroic men fearlessly facing death to gather the intel that tipped the scales to win the Cold War. Winning the Cold War is in the balance. A super-secret, off-the-books spy organization; a security-clearance starting at top secret and going up from there; an attack by giant squid during a 1,000-foot dive while breathing an exotic gas; a cat's whisker escape from death during a three-day decompression - and that's just the first two chapters of Operation Ivy Bells before the action really gets underway. Blending personal experience and real-world events in a fictional wrapping, Operation Ivy Bells offers a never-before-seen glimpse of these heroic men fearlessly facing death to gather the intel that tipped the scales to win the Cold War. Although this book is classified as fiction, it is based so heavily on personal experience that it reads more like a memoir, or, perhaps, the literary version of a docudrama. 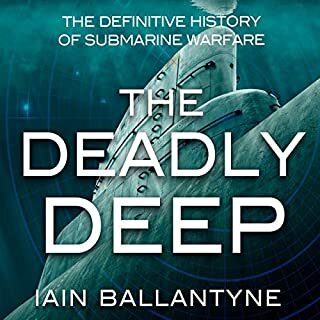 For those who, as I do, love anything involving ships and sailing, (above or below the water) this is a gold mine of information and provides an insightful and fascinating view of life on a submarine, at its most calm and at its most frantic. There is a lot of technical information, but the author skillfully presents it so that even this landlubber understands enough to follow what is being done, how and why. I found that, perhaps because the subject interests me, the wealth of technical information did not make the book drag, but this is not a thriller, at least in the traditional sense. When things happen, though, they happen very quickly, but, because the author has prepared the ground very well, he can present the action with tension and immediacy, not having to stop the flow for explanations. 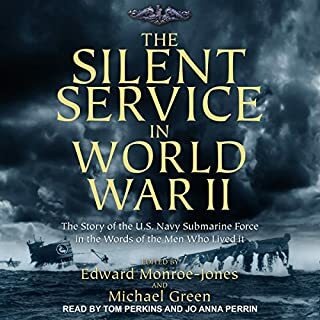 In contrast to the technicalities involved, the author presents the characters in very human ways, and we come to see then, not as moving parts of a demonstration of submarine operations but as individuals. There are some very moving moments, and a good bit of humor, especially in the interactions between the characters, and the author captures the way a good team works together very nicely. Granted I occasionally thought that the main character (drawn from the author’s personal career and experience) seemed a bit *too* smart and versatile in solving problems, but perhaps the author is simply describing his actions, and the character is never too quick to take credit for his accomplishments. He is a team player, and often, ideas spark from the team, and he is able to combine them in some unique ways. The story itself is amazing, more so because it is based on actual events. Again, the meticulous description of what the divers did, and how they did what they did enhances the story and gives in immediacy. I found this narrator’s voice extremely pleasant, and enjoyed listening to his narration. He has an extremely low key, calm style, yet he is able to differentiate his characters well, and has good expression, though it is expressed in subtle ways. Very occasionally, I wondered if his style was a little too soothing, but then he would have to change his presentation slightly to accommodate the text. By the end of the book, I decided that he was perfect for this sort of book, and would probably excel at any nonfiction. Because this book was so thorough and so well presented, I give this book 5 stars, though I do not recommend it for those looking for a traditional thriller. I also give the narrator 5 stars, because he was able to invest even the most technical passages with life and interest. I received a copy of this book in exchange for this unbiased review via the courtesy of AudioBookBlast dot com. Yes I would to some one who like this genre. The tale is a slightly fictionalized account of a true event during the cold war era. I general I love historical novels especially good ones that don't re-write history and this novel fits that bill. I learned about a true naval operation that occurred during the cold war that I never before was aware of. Which character – as performed by Mark Budwill – was your favorite? At first I was a bit bored with the book as the start was a bit slow and not action packed. However the book kept getting better. The book was well written and preformed and there is more action as the book progresses. Also the story is educational and informative. Not only did I learn about a cold war navel operation I also learned some nautical jargon and about low depth immersion diving. Such as the gasses used, the equipment, decompression and so forth. This may be a bit boring though for some one who is not into navel and driving stuff. Over all the book was excellently written, educational, informative and entertaining. I think that it could make a good move that would be a far more realistic fact based tale than such movies as the 'mission impossible' films. As an ex-squid I really enjoyed this take and the history behind it. I found the limits of my regular commute time frustrating because I didn't want to stop listening. A glimpse into the "Silent Service"! These men are some of the most dedicated soldiers serving our country. 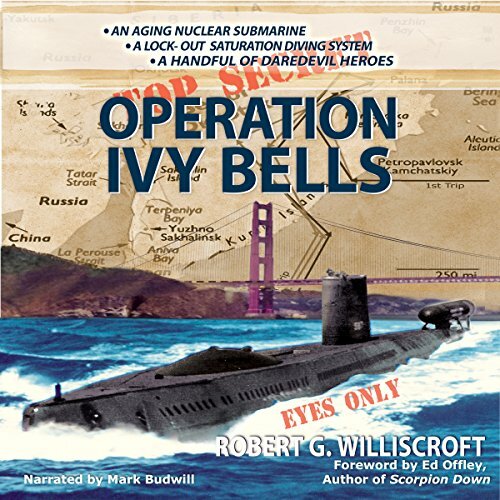 Where does Operation Ivy Bells rank among all the audiobooks you’ve listened to so far? Have you listened to any of Mark Budwill’s other performances before? How does this one compare? Loved this story! Sucked me in and wouldn't let me go. Only complaint would be that the narrator was a bit monotone in the beginning. I will say right up front – I hated that this story had to end. Operation Ivy Bells is wonderful! Operation Ivy Bells is an exciting piece of fiction/non-fiction. Robert Williscroft led a saturation team that faced terrible odds at times and were also hell raisers – a certain Russian Submarine Commander could attest to that! In the first few chapters, Lt. Mac McDowall and his saturation team face giant squids, a near death experience and live to torment a soviet commander. 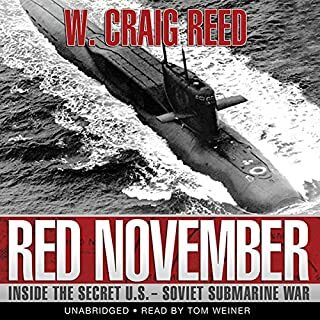 During the cold war, Mac and his team of divers must do what no one else has even considered – diving to depths of 1,000 feet, riding the ocean floor during a major storm and within 500 feet of a soviet submarine and more is a story that everyone should hear. This book is full of excitement and twists – I named only a few. You have to read it to hear more and it is WORTH it! Williscroft writes such an intense story that one cannot even begin to tell what is truth and what is fictionalized. I was amazed at several things in this story. The first being that he was able to relay technical information in an informative manner but also interesting – who would have thought going to the restroom on a submarine could be deadly? Or that a submarine crew must be aware of water density, depth, and that every sound can be deadly? The second is not being able to tell what is truth and what is not – for instance, who is to say there are no giant squid that undulates in color? The news is full of new sea creatures (giant and otherwise) being discovered. Third, his writing demonstrated just how deadly yet exciting being 500 – 1000 feet below the water can be. Williscroft’s writing style is excellent. The technical aspect of the operation of a submarine and divers was very realistic – AND interesting. The story flowed, the character development was executed perfectly and the plot was a complete piece of work. In other words, there were no holes anywhere. I hope to hear more by Williscroft in the future. This is definitely a story that will appeal to those who are into conspiracy theories, spies and espionage and a good piece of fiction! Mark Budwell did a wonderful job of narrating the story. His voices were excellent and indicated just the right amount of intenseness and excitement. He was perfect for this book! There were no issues with the audio production.